Give the pizza, wings and chips a rest this Super Bowl Sunday and serve some Caribbean fun and flavorful new dishes that are sure to become new menu favorites. Sure, it doesn’t get any easier than dialing Pizzas R Us, but with little effort you can make that Super Bowl party menu a lot more exciting! An informal poll among my friends confirms that the most popular Super Bowl Sunday food is pizza, chicken wings, and chips and salsa to accompany very cold beer. So I searched through our recipe files and came up with an alternative menu that is guaranteed to make you the host extraordinaire of your party. Start with the nachos…yuca nachos, that is. Check out one of my favorite Chef Kenny creations, Yuca Nachos with Chorizo con Queso, where the fried yuca croutons replace regular tortilla chips. The chorizo con queso mix, black beans, avocado, corn, sour cream and jalapeños keep the nachos “honest,” while the cilantro and yuca croutons give them a Caribbean touch and a signature detail. For those with milder taste buds, you must include in your menu the Yuca Cups Stuffed with Crab Mango Salad with Blood Orange and Poblano Peppers. This is a delicious option that is easy to prepare and easy to serve. 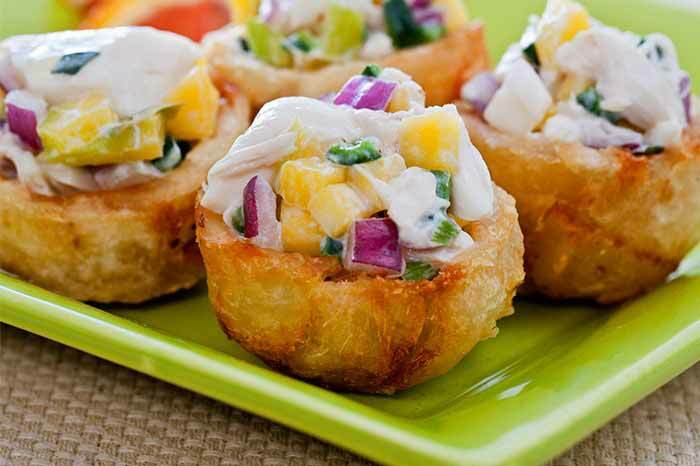 The combination of distinct tastes, crab meat, red onions, and the mild Poblano peppers, combined with the sweetness of the mango and orange juice inside a crispy yuca cup, make this a delightful harmony of flavors in your mouth. And of course no Caribbean party menu should skip sweet plantains. I recommend Chef Kenny’s Prosciutto di Parma Wrapped Sweet Sliced Plantains with Tarragon Arugula Pesto and Shaved Pecorino Cheese. This is the ultimate appetizer, rounding up a trifecta for your Caribbean style Super Bowl feast. Check out our recipes page for more ideas and let us know on Facebook or Instagram which is your favorite!